Benjamin Kunkle, the first white man to make permanent settlement in Guthrie county, was a Methodist. and was preached in Mr. Kunkle's cabin to a congregation of ten or twelve persons. 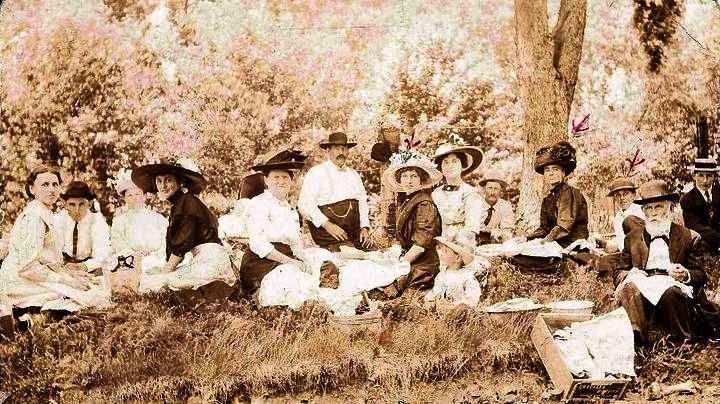 1st Quarterly meeting in 1861 at Bear Grove. Building Committee: (1868) Eli Grandstaff, William Tracy, David Paxton, John E Motz, E Kostenbader. Church property at Guthrie Center. 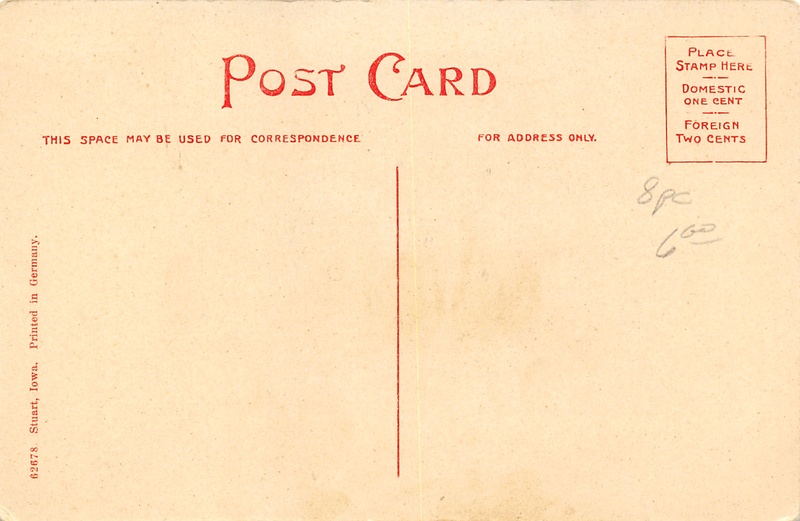 1882 Members: Mr. & Mrs. Wilson, Mr. & Mrs. Littlejohn, Mr. and Mrs. Dewey, Mr. & Mrs. Lynch, JW Leach, Mr. & Mrs. William Stevenson, and Mr. & Mrs. Miller. Non resident ministers: Rev. George W Rawlings, Rev. AW Leach, and Rev. SS Todd of Bagley. Members: William Melholland and wife, Joshua Simmons and wife, Edmund Pickett and wife, Mrs. Lewis Harrington, Mrs Susan Simmons. 1876 the Free Methodist led by Rev. Stannard alternately held services in the same school house. Rev. Nutz was also a minister of this group. Organized 1854 by Elder Clayborn Wright of Greene Co.
Members: James F Moore, Samuel Lafferty, Mrs. Samuel Lafferty, George L. Teter, Mrs. George L. Teter, Dudley M Thompson, Mrs. Dudley M. Thompson, Henry Cretsinger, George M Cretsinger, Isaac M. Cretsinger, Mrs. James F. Moore and several others. Original members: Benjamin Mitchell, Bernetta Mitchell, William Jackson, Rachel Jackson, William Jones, Margaret Jones, William and Mrs. Miller, Samuel and Mrs. McClaran, Horation Shaw, Ozias Shaw and others. Organized 1856; held services at school house at Sec 3. Members: Martin Smith and wife, Jacob Smith, Aaron Smith and wife. Members: EJ Reynolds, JW Gustine, Samuel Anderson and wife, Mary J Hill, Charles L Fogg, Hannah Kellogg, Margaret Lenon, Robert Farnsworth and wife, Nancy J Farnsworth and Maria Townsend. Members: John Mains and wife, Henry Mains, Mrs. Sarah Mains, Mrs. Annie Mains, Miss Laura E. Maines, Mrs. Hattie R Anderson, William Neeley and wife, Mrs. Tabitha McHargue, David Roach, Miss Hattie Roach, Mrs. Sarah Irwin, Mrs. Jemima LT Mains, Daniel Mains and wife. On March 21, there was organized in Lincoln township, Adair County, a few miles southeast of Stuart, a Congregational church. 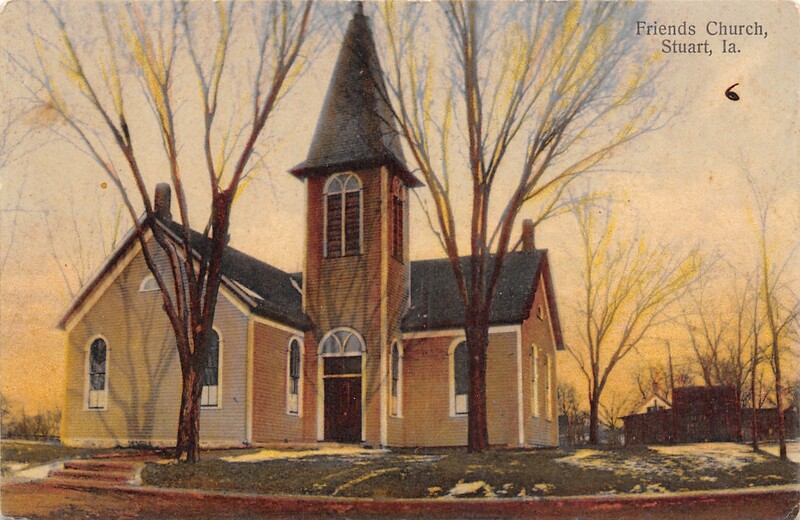 It was called the First Congregationl church of Lincoln and was composed of nine members, gathered from the families that had moved into the region during the preceding summer and fall. This church continued in existence for two years, but was never very strong. In the meantime Stuart was giving promise of future growth, and in 1871 the question of organizing a Congregational church was agitated. Finally it was decided to transfer the Lincoln church to Stuart, and for this to form a nucleus of a new organiztion. 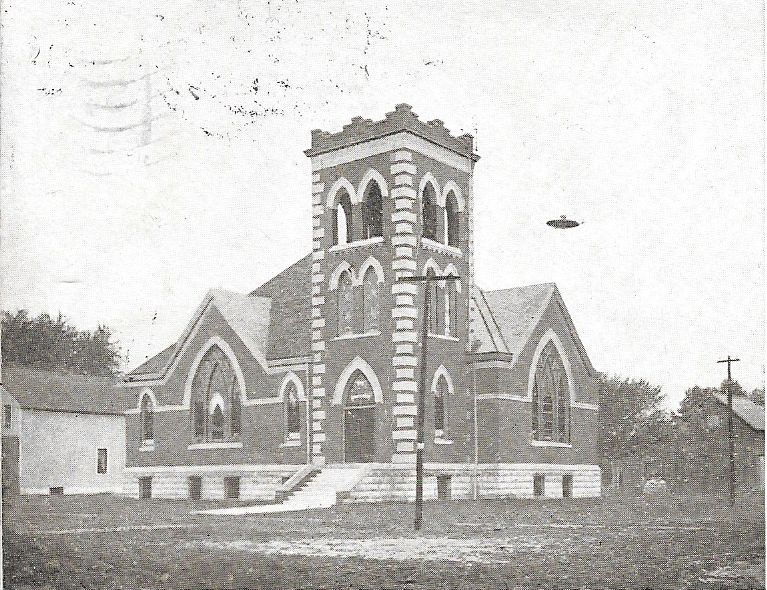 In this way, on June 10, 1871 the First Congregational church of Stuart was organized with twelve members. During the ensuing year the first church building was erected, costing about two thousand five hundred dollars, and was dedicated July 14, 1872. From its beginning the church, for many years had a hard struggle, but there was manifested the spirit of self sacrifice and devotion on the part of the membership. During the thirty six years of its history the church has been served by the following ministers. The active organization of the church has been the Sunday-school, organized early in its history. In 1903 a fine brick edifice was erected costing, with the lot upon which it is built, twelve thousand dollars. This beautiful structure was dedicated March 6, 1904. The resident membership at the beginning of 1907 was one hundred and thirteen, of which twenty nine were males and eighty-four females. 1884 officers: John Carson and wife, Jamee Catell and wife. Building in Casey in 1882; Committee: SB Chantry, Amos Davis, Joseph Betts, Alonzo Rhinehart, SP Chantry, and their wives. Not much is given in the way of additional information, but in addition to the ones listed above there was one in Adair (blt. 1879), one at Stuart, and one being built at Fontanelle. Dedicated July 26,1903 with over 800 worshipers; built on the site of the old church at a cost of $11,208, excluding stained glass windows and an unfinished basement. Excavation of the basement was finally finished in 1972 by Rev. Tom Hotle and his Boy Scout troop. It had double tinted Omaha brick on the exterior, fresco ceilings and oak woodwork There were over 4O electric lights in the sanctuary. Des Moines architects Smith and Gage drew up the plans for the building. Contractors were local men, Messrs. Nicholas and Brown. The PUM Church shared a three-point charge with Linden and Morrisburg. 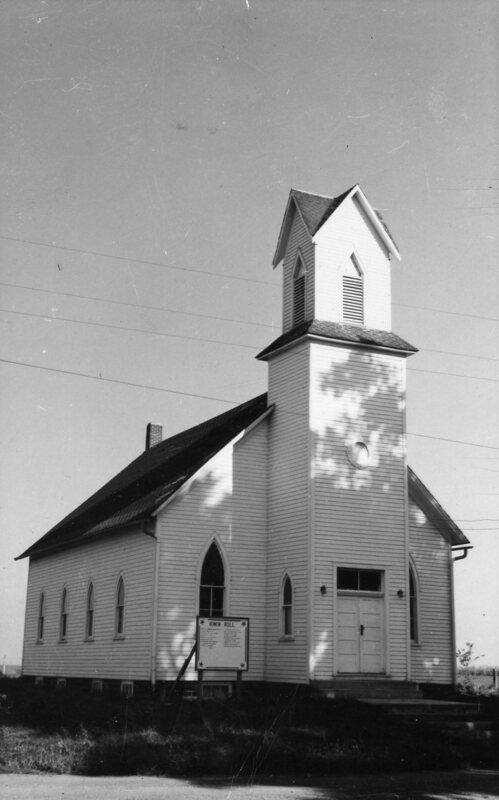 By 1960, five churches were included, expanding to a nine-point charge forming Hope Parish. Three ministers served the parish. At the turn of the century, Panora resigned from the parish and became an independent congregation of the Iowa Methodist Conference.